I can't remember the last time I stepped out in my garden. Over the past three months, I've managed to avoid most tasks that have involved venturing out in the garden. Tasks such as cutting and bringing up fresh hardy herbs like rosemary, sage and thyme for cooking; and emptying vegetable scraps into the compost bin had all been allocated to my husband, as the wimp in me wanted to stay cosy and warm inside, dry from the wintry weather that has been battering us all all recently. Well today the sun shine came out and I could not ignore the gardening tasks ahead of me, so I stepped out for a little while. 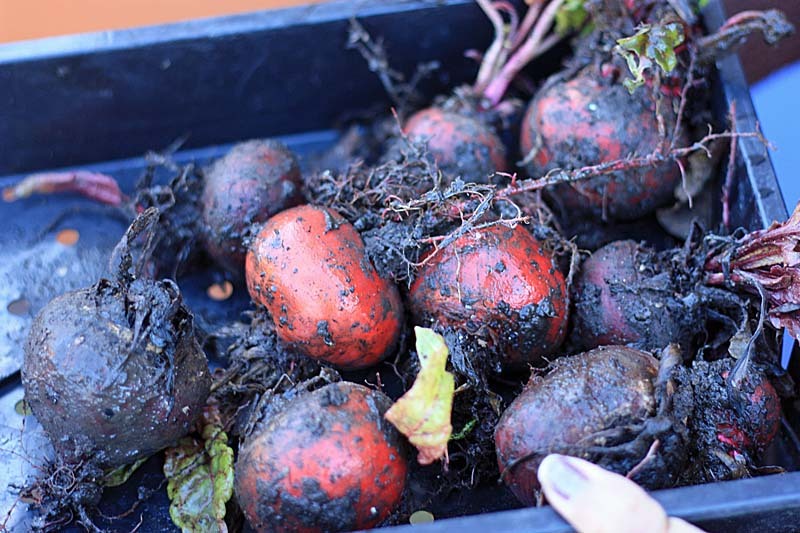 Whilst pottering around a little and taking mental notes of what has to be done, I harvested the last of my vegetables: Beetroot - Barabietola di Chioggia and Detroit 2. As I dug them out, I found so many wriggly worms - an excellent sign. After washing them thoroughly and delighting over the colours, I wondered what to make with them? Wow! So many ideas!!! Now i don't have any excuse not to eat healthy!!!! So pleased to read you have been able to get out in the garden. Now didn't that lift your spirits. Don't worry MC...the harsh weather will soon be gone and spring is here soon..and you will get it before us in Nova Scotia. 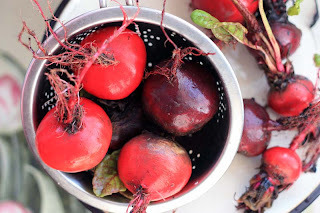 Your beets look lovely, but I am tired of the root vegetables..I want spring food now. Can't wait for asparagus, and early greens from the raised bed. Now, have you found any new to you pots or containers for your garden? Beetroot risotto! Yum, thanks for all the great recipes! Are those Barbietola di Chioggia the ones with concentric rings of pink inside? And if so, do they taste any different to the red ones? I have bought some seed for golden beetroot this year. I tried them recently and found them to be much sweeter than the red ones - intriguingly different. Thank you so much donkey and the carrot. Always an honour to hear from you Dear Brenda. I am really looking forward to the spring. I've hardly seen any snowdrops here. Looking forward to a little colour to brighten the days. I understand your tiredness towards the root veg. I too am lookign forward to Spring food. I did come by earlier, and see your asparagus. My husband is really envying that raised bed of yours :) He likes asparagus much more than I do, so is waiting patiently for the season to arrive. I think I have my fair share of pots, so no more for now. Warmest of wishes. Thank you Ocean Breezes and Country Sneezes. Its a pretty shocking colour. The Barbietola di Chioggia are the ones with concentric rings of pink inside. Yes they do taste a little differnt from the red, not as earthy in flavour, a tad milder. Two years ago, I grew the golden beetroot. I def. prefer the gold to the red and pink. Beetroot risotto, is definitely my favourite. The colour of beetroot risotto just stuns the senses. beautiful photos. have you started any seeds yet for this season's garden? What gorgeous beet and they haven't been eaten by any pests while they overwintered - lucky you. Ours were munched away. Here comes spring at last. I have yet to make the famous beetroot and chocolate cake. I might possibly do that in the next few days. Both have been taken by my husband, so I will pass on the compliment. I haven't started sowing any seeds. My head is not there yet, sadly have other things on my mind. A couple of them were nabbed by the pests, but most of them were good. Yes welcome to the spring.